The verdict for the ARTMARK New 2017 Portable Fish Finder goes out in the positive. You have all the necessary features which have worked in an outstanding way for all the customers who tried it. Yes! 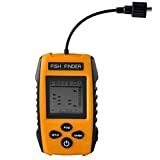 You might face the issue regarding instructions which are unclear, but when it comes to the performance of this fish finder, you will not face any issues at all. Most of you interested in fishing might have landed here if they were tired of just searching for fish and couldn’t get a lot of help out there in the sea. In other cases, many users might have been here to replace their old fish finders as well. Well, what is a fish finder? A fish finder is a device, as stated by the name, which searches for fish under water. How? It works on SONAR Technology which means “Sound, Navigation, and Ranging” system. There are different types of fish finders available in the market and you can get the one you want at a normal price as well. Maybe then, you will be able to grab the most fish in the least time. Take a look at the following review of the ARTMARK New 2017 Portable Fish Finder. First off, we need to look for the features which matter the most in the case of a fish finder. The detection of fish must be accurate as well as in the case of grass, weed, and sand. The sensors used in this fish finder are the round transducer sensors along with a 7.5mm cable. You will be able to get an approximate location of fish in the water and, the depth of the water. With a good sensor technique being used, the detection of fish is going to be much easier. There are other features 2017 ARTMARK Portable Fish Finder as well such as water temperature indicator and the fish size display. Accuracy and detection would be of no use at all if you don’t have a clear LCD display. In the case of the ARTMARK 2017 Portable Fish Finder, the LCD display is quite clear and provides a depth readout between 0.6 and 100 meters. There is a 45 degrees beam angle along with fish depth scale and audible fish alarm so you always have an idea of what is there under the water. Sensitivity can be adjusted as per your own requirements. There is a water-resistant design so you don’t need to worry about the accidental water spills. There is a battery save mode as well which means you can stay out in the sea for long. The removable float is there as well. With all other things being kept in mind, this seems to be the perfect partner for your day out in the deep waters. Get it from amazon.com and enjoy.